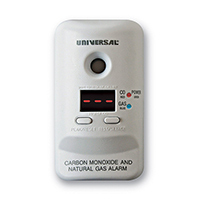 The MCND401 Smart Carbon Monoxide and Natural Gas Alarm from Universal Security Instruments provides twice the protection with one installation. It detects the silent, odorless carbon monoxide gas as well as natural gas (methane). This 120-volt alarm is ideal for both replacement and new installations. Installation is easy, with no wiring required, as it is designed to be plugged in. It is great for use in apartments, houses, and mobile homes. The 9-volt alkaline back-up battery will provide comfort even during a power outage. When it is time to be replaced, an end-of-service life warning will sound. This smart alarm also features a digital display screen that reads and records gas levels. It will display "GAS" at the time of an occurrence.